Every month in New York, there’s a bewildering number of new dishes to eat, drinks to imbibe, and food-themed events to attend. Often, the hardest part is just figuring out what’s really worth your limited time. So Grub kicks off each month with a curated collection of dishes, drinks, and events that should absolutely be on your agenda. Make your plans now. 1. Help Houstonians affected by Harvey. Houston and southeast Texas have experienced unprecedented flooding as Hurricane Harvey slammed the city. A Houston suburb already recorded the highest rainfall (51.12 inches) for anywhere in the continental United States during a single storm on Tuesday, and on Wednesday the storm made a second landfall in Louisiana. It’s estimated that as many as 30,000 people will need to be placed into shelters, and they’ll need your help. You should absolutely donate to local hunger-relief organizations. If you’re going to spend money at restaurants, consider going to one that will help out. Agern is offering half-priced drinks to any guest who brings in canned food, which the restaurant will donate to the Houston Food Bank; Blue Ribbon Restaurants will donate 10 percent of sales today; and on September 5, Left Bank will donate 10 percent of sales to Best Friends Animal Society’s relief efforts to help stranded animals in the Houston flood zone. Left Bank will also offer a special cocktail that night, the Furever Home ($14), with 75 percent of sales going to Best Friends. On September 5, speedy omakase spot Sushi on Jones will donate donate 100 percent of proceeds to Houston-area animal shelter Citizens for Animal Protection and from August 31 through September 4, all three of Del Frisco’s New York restaurants will donate 20 percent of sales. It’s no secret that many people who work in the restaurant industry are on shaky ground economically, and are among those particularly vulnerable to disasters like Harvey. Consider helping them by donating to the Bartender Emergency Assistance Program, which is managed by the United States Bartenders’ Guild Foundation. 2. Drop by for dinner at one of the Flatiron’s best lunch spots. Verde is like Sweetgreen on flavor-enhancing steroids. The Flatiron spot was opened by former Cosme general manager Gonzalo Gout and chef de cuisine Mariana Villegas, who take a fine-dining approach to the kitchen while keeping it quick-service up front. They’ve moved beyond the salad-for-lunch crowd, and now serve a dinner menu with dishes like new potatoes with housemade chorizo ($14), halibut crudo with green Venezuelan cocktail sauce ($19), and a half-roast-chicken with peanut mole ($29). There’s beer and natural wine to drink, too, for a complete meal. 3. Hit up a Labor Day party. There’s no reason to feel left out if you’re staying in the city this weekend. Not only are restaurants easier to get into, but there will be some parties to keep you entertained. Williamsburg bar Maison Premiere will have its annual Labor Day party, with the usual barbecue specials and live jazz starting at noon. 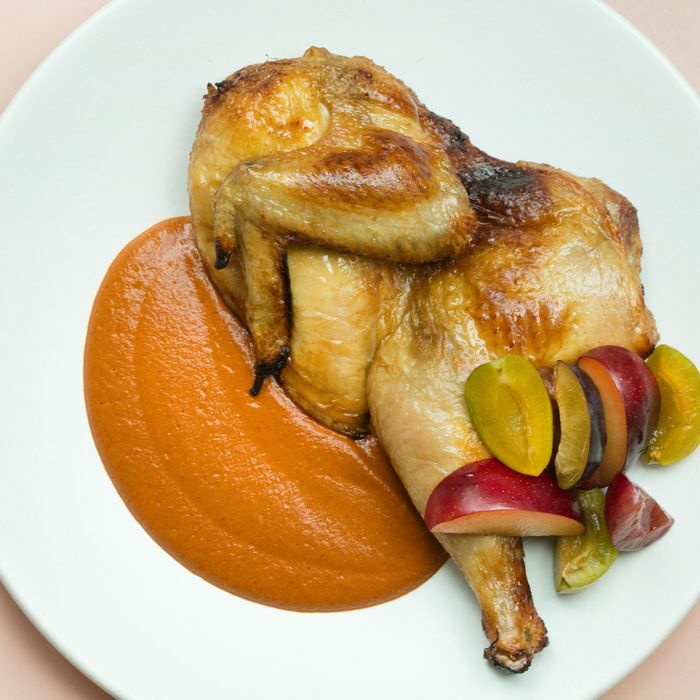 The Standard will host a low-country boil ($62; reservations can be made via Narcissa) in its summer garden, with $8 frozen Jungle Birds, $30 buckets of beer, and a three-course menu. For those who prefer to drink rum in the company of kittens, cat café Koneko will host another edition of its Kiki Tiki party (tickets are $50) with charcoal-grilled pork sliders, all-you-can-drink beer and rum punch, and hang times with the cats, every one of which is up for adoption. 4. Satisfy your sweet tooth with Italienne’s new six-part chocolate dessert. Speaking of the Flatiron, sugar fiends take note: Italienne has introduced the “Voyage de Valrhona” ($35), an architectural dessert for chocolate geeks. The tiered dessert features six types of single-origin chocolate, going from milk chocolate to a dark 72 percent variety. All are made in-house and paired with ingredients indigenous to each variety’s region of origin. A Ghanaian chocolate has a creamy kola-nut filling, while the Madagascar chocolate is flavored with and shaped like a vanilla bean. If you’re inclined to go all in, there’s a dessert-wine pairing ($17) available, too. We are doing a canned food collection at agern, all donations go to @_houstonfoodbank_ Texas I love you, you were my first home in this side of the river. 5. Go listen to talks from the authors of two of 2017’s most exciting food books. This month, the 92nd Street Y will host the first-time authors behind two of the year’s most notable and exciting food books. (Both events are $29.) On September 7, culinary historian Michael Twitty will talk (information here) about The Cooking Gene. One of the country’s most incisive voices and curious minds writing about food today, Twitty traces his family roots and the politics of southern cuisine. Then on September 13 (information here), writer Stella Parks will sit down with Ed Levine to talk about BraveTart: Iconic American Desserts. Her book is a fun, compelling exploration of the science of junk food, and how you can use it to become a better cookie monster. 6. Eat Danny Bowien’s hot sesame-paste noodles, which could be your next noodle obsession. There are always more noodles to eat. Seven years into Mission Chinese Food, Danny Bowien and his kitchen co-pilot Angela Dimayuga are still messing with the menu. After gravitating away from the Sichuan-leaning, hyperspicy dishes that made the restaurant famous, Bowien has returned to those roots. Take his hot sesame-paste noodles with flavors of Xi’An ($13), a recent and popular addition to the menu. The dish was inspired, in part, by some time he spent in Chengdu for Mind of a Chef. But he calls it “kind of Chinese, kind of Oklahoma, kind of Korean.” For now, it’s cooked with slippery noodles made from green-bean starch. The sauce is an equal mix of Soom tahini (thinned out with lemon, garlic, and cumin) and a purée of pickled pepperoncini peppers and caramelized ginger and garlic, plus red oil, ginger-scallion sauce, and rock sugar. It’s then garnished with pea greens; tomatoes macerated with dill, salt, and vinegar; Korean sesame leaves and daikon; Korean soybean powder; and a peppery jelly with crisp roasted chilies. 7. Get in your last soft serve of the season. 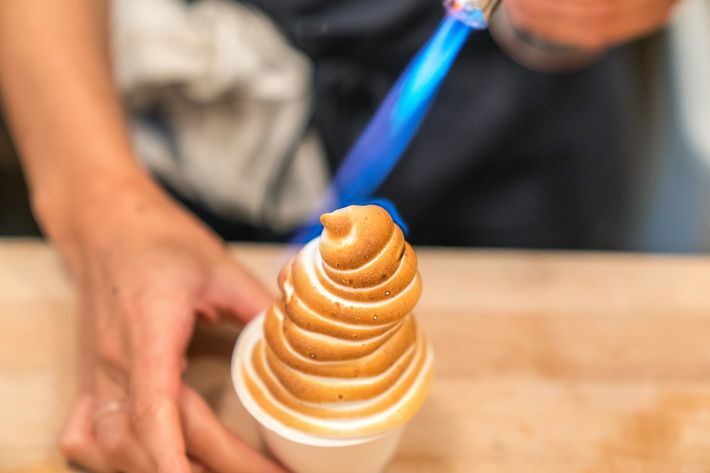 Reigning brunch champion Sunday in Brooklyn introduced soft serve over the summer, and the other week started offering it from a takeout window ($5 or $7 with toppings). Even if you aren’t on a never-ending mission to eat every new version of the frozen treat popping up in this city, it’s well worth checking out. There’s a summery mixed berry, along with a dairy-free chocolate that’s got the texture of proper soft serve, but tastes as purely of the cocoa powder it’s made with as a chocolate sorbet. Bonus points for fancy toppings: The chocolate flavor can be made into a s’more of sorts with torched marshmallow, while the mixed berry gets meringue kisses and mint dust. 8. Eat fancy hot dogs, go to the largest sake festival outside of Japan, and attend these other food events. Kick off the month with Taste Talks Brooklyn (tickets are $49 to $299; NYxNY members can get a 50 percent discount on the All-Star Cookout), which returns to Williamsburg September 8 through 10. Science-minded chef turned doughnut man Wylie Dufresne is behind this year’s lineup, which includes Paowalla chef Floyd Cardoz, former Food & Wine editor-in-chief Dana Cowin, and Olmsted chef Greg Baxtrom, along with events like a demo on Japanese home cooking and the second annual Tasty Awards. It’s not exactly the Nathan’s Hot Dog Eating Contest (and Joey Chestnut won’t be around), but on September 13, the Standard will host FRANKS ($30). Chefs John Fraser, Angela Dimayuga, and Gerardo Gonzalez will cook special hot dogs for the one-night-only event. Later in the month, the world’s largest sake festival outside of Japan will happen on September 27 at the Metropolitan Pavilion. The Joy of Sake (tickets are $110) features 217 sakes not available otherwise in this country, along with appetizers from restaurants including Momofuku Ssäm Bar, the recently opened Oka, and more. Finally, on September 28 at 6:30 p.m., the Museum of Chinese in America will screen Ivy Lin’s Bitter Harvest (admission is free for members, $15 for adults, and $10 for students and seniors), a short three-part documentary about the role of immigrant Chinese workers in founding Oregon’s craft-beer industry. 9. Head out to Long Island’s North Fork for a meal at the restaurant from the chef behind the West Village’s Mas (farmhouse). Chef Galen Zamarra is a fixture of the downtown dining scene. If you’re planning a weekend out east this month, consider heading to his recently opened restaurant, Halyard, in the new Sound View Greenport. The hotel is on a private beach, and the menu is appropriately seafood-centric, with fried clams with saltine-buttermilk batter ($16), lobster rolls ($27) and lobster beignets ($20), and classic desserts like an icebox cake ($14). Plus, the dining room has big windows that look out onto the Long Island Sound, so you can bask in late-summer light. In Ichiran and Chuko, Bushwick has seen a pair of heavy hitters arrive on its nascent ramen scene. It’s gotten even more crowded, though, with the opening of two more options for noodle fans. The owners of Williamsburg’s popular Suzume have opened Lua Bar, a “ramen party bar” that serves affordable cocktails (the beer is a better bet) alongside snacks like spam corn dogs ($7) and several bowls of noodles. The best is the namesake Lua ramen ($10), made smoky by burnt garlic oil. Hailing from the slightly-further-afield land of … New Jersey, Ajihei is a combination sushi-and-ramen spot that’s been covered positively by the New York Times. Along with dishes like tebasaki chicken wings ($7) and chirashi bowls ($24-$28), there are four varieties of ramen ($11 to $13) in shoyu, shio, tonkotsu, and the rarer tantan men, made with a chili-sesame broth. 11. … Or head to E.A.K. for a special tsukémen ramen. Speaking of ramen: Japanese import E.A.K. Ramen will offer tsukémen ($16) for the month of September. The style is also known as dipping ramen, because the broth and noodles are served separately. Here, the broth is made with bonito, while the thick noodles are chilled and served with ajitama eggs, pork chashu, bamboo shoots, and nori. 12. Seriously splurge on Eiji Ichimura’s new omakase. Sushi chef Eiji Ichimura has had a rocky journey since leaving David Bouley’s realm last year. Just four months after opening Ichimura, he stepped away from the restaurant (reportedly for health reasons), sued in his partners, and was countersued. Don’t call it a comeback, but on September 5, he opens the ten-seat Uchū with Sushi on Jones owner Derek Feldman. Fans with deep pockets will be happy to hear that the menu looks like vintage Ichimura. The omakase will last 18 to 22 courses ($300), in some cases using ingredients like kinome (the leaf of the Sichuan peppercorn) grown on the restaurant’s rooftop garden. To compliment the food, there will be a mix of sake, Old World wines, and a lot of Japanese whiskey. 13. Drop by Mad. Sq. Eats, returning to Manhattan this month. Days for outdoor eating this year are number, so make the last ones count. On September 2, the outdoor food market Mad. Sq. Eats returns to Worth Square in Manhattan. It will open daily from 11 a.m. to 9 p.m. through September 29, with a lineup that includes a mix of standbys like Roberta’s and Red Hook Lobster Pound, along with rookies like Daa! Dumplings, which makes Russian dumplings with fillings like lamb and Feta and potato and mushroom.